Saturday Garbage Plate: Looking for love and Teese! Vegan pizza slices: The dough recipe I used is from Vegan with a Vengeance by Isa Chandra Moskowitz. Highly recommend! Vegan pizza with kalamata olives, cipollini onion, parsley and tomato. CC image via Flickr user slightlypale. Saturday: Grilled Pizza from What The Hell Does A Vegan Eat Anyway? Contests! : Vegan Backpacker has three boxes of Primal Strips vegan jerky up for grabs; SporkOnline is giving away free online cooking classes to eleven lucky winners; FaveDiets is offering up two prize packages of MATCH vegan meats; and Tofurky is hosting the coolest contest EVER. Some of these giveaways end as early as tomorrow, so enter to win today! vegan craigslist missed connections: now inspired by teese cheese! Forget the Washington Post; when vegan pizza pops up in the classified ads, then and only then do you know that veganism has gone mainstream, baby! Spay & Neuter Kansas City needs some extra helping hands! Check out SNKC’s latest list of volunteer opportunities here and, to get an idea of what they’re up to, see their weekly recap here. They spayed and neutered 97 dogs and cats and distributed 262 lbs. of pet food this week. Very awesome, guys and gals! You have seen the protesters outside Planned Parenthood intimidating and harassing women for months; now it is time to show that mid-Missouri supports PP! Please join us on Friday, January 21st from 11:30-1:00 as we celebrate the 38th Anniversary of Roe v Wade by showing support for Planned Parenthood. We will have plenty of signs but feel free to bring your own. Since we’re dishing about all things local this week, why not end with a video about veganism in Kansas City? VegNews correspondent The Healthy Voyager – intrepid as she is – visited the so-called Steak Capital of the world last summer in order to explore KC’s vegan options (surprising as they are in number). Featured eateries include McCoy’s Public House; Waldo Pizza; blanc burgers + bottles; The Drop: Bar and Bistro; and the blue bird bistro. But Eden Alley? Inexcusable! Best vegan buttercream cake ever! Posted: 01/15/11 at 12:38 pm. Filed under: Saturday Garbage Plate. Alabama and Indiana – two big, beautiful tuxedo boy-cats – lazily lounge in a two-tiered window seat of some kind, staring off behind and to the right of the camera. They’re wearing complementary blue (Alabama) and red (Indiana) colored collars – so cute! Photos courtesy Assisi Safe Haven for Cats. It’s been several weeks since we’ve featured cats, so today we’re all about the felines here at the PPP! Two felines in particular: namely, Alabama and Indiana, a bonded pair of brothers who are currently staying with Assisi Safe Haven for Cats in Lansing, Kansas. Just for poops and giggles, I refined my initial Petfinder search for adoptable cats to include “extra large” felines only, and these guys were two of the sixteen cats who came up. Just sixteen! I wonder what size and weight is considered “extra large” in the feline world? There’s definitely a little more to love on these guys, but neither of them look especially leopard-like. Bring them home, they’ll keep your feetsies nice and toasty! Ditto: your heart. Posted: 01/14/11 at 5:18 pm. Filed under: Find-a-Friend Friday. black olives, TVP, sliced herbed tomatoes and shredded rice Mozzarella. Yum! Photo via Flickr user norwichnuts. 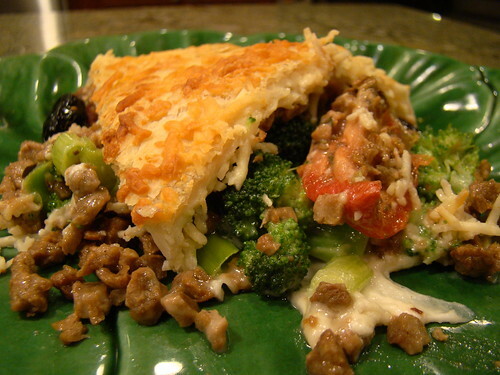 Stuffed crusts, pizza muffins and vegan Stromboli, oh my! Make sure your bib is tucked in, all nice and snug-like – here’s this week in #nom! Monday: Calzone o Greatness from the apeman! Tuesday: Pizza with Garlic Sauce (and a Gingerbread House) from Oh, for Pete’s Sake! Do you receive SNKC’s weekly newsletters? No? That’s okay, ’cause I do, and am happy to share! Spay & Neuter Kansas City now sends out a weekly update of its activities and accomplishments, as well as its current volunteer opportunities. Here’s a link to the most recent edition. I’ll include these in each week’s roundup, at least for as long as I remember to. Give me a friendly poke or holler if I forget, okay? Between its spay and neuter assistance and “pet” food pantry, SNKC does great work. Help them out if you can – pretty please with Daiya on top? Over at Vegan Planet, Robin Robertson is giving away a copy of her latest book, Party Vegan, to one lucky reader. The deadline to enter is January 12, so don’t delay! Vegan Pizza Day is coming! Are you ready? To get y’all in the mood – as if any help is needed in this department! as. if! – here’s Eco-Vegan Gal’s review of Pizza Fusion, one of the astounding 99 (that’s NINETY NINE, as in one less than ONE HUNDRED!) Californian vegan and/or vegan-friendly pizza places included in Vegan Pizza Day’s list. Just for comparison: Missouri has four. FOUR! In just two cities! Kansas? ZERO. Bleh. Midwest vegans, we have seriously got to up our game. I am embarrassed for us. SERIOUSLY. * Post title shameless borrowed from Vegan On A Mission. I gets a giggle every time I see it! Posted: 01/8/11 at 2:48 pm. Filed under: Saturday Garbage Plate. Lokey, a handsome young white and gray tabby cat mix. For this week’s Friend in need, we’re going a little north of Kansas City – as in, aaaallllll the way up to Smithville, Missouri. (My exaggeration is deliberate. The husband and I live up there, you see!) Katty ShacK is a feline rescue group based north of the river; it’s here you’ll find dear Lokey, a cute little guy in need of a home. Preferably before the Christmas holiday, so he doesn’t miss out on gifts of catnip and scratching posts! Lokey is a young adult, a little lanky right now. Will be a big beautiful guy when we get a little weigh on him and on a good diet. He is a loving guy, talks a lot in the morning! Found hanging around a barn, this tame and loving guy deserves a better life. The KattyShack is located in Smithville, MO. The KattyShack is open on weekends for potential families to come and meet the cats and kittens. Before coming however, the adoption application needs to be completed and e-mailed to kattypeggy [at] aol.com. Visit Katty ShacK’s Petfinder page to find out more about this special guy, or to view the other cats and kittens currently available for adoption. Posted: 12/10/10 at 5:55 pm. Filed under: Find-a-Friend Friday.